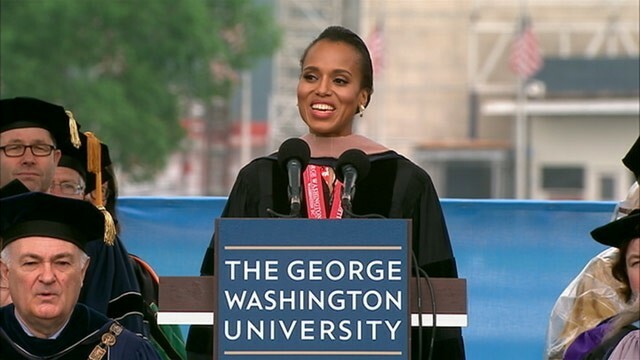 WASHINGTON — It took a “Scandal” for George Washington University alum Kerry Washington to return to her alma mater as the 2013 Commencement Speaker. 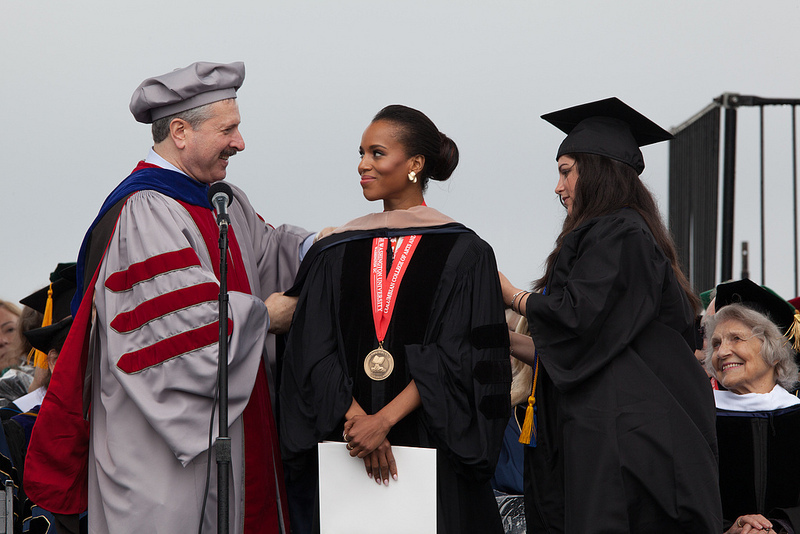 The film and television star, who graduated from the school in 1998, received an Honorary Doctor of Fine Arts Sunday and inspired students with a 15-minute address on how she transitioned from an anthropology and psychology major to acting. Her speech was full of themes typical of a commencement address: embrace change, keep an open mind, take on new adventures and “become the frog.” Well, that last part wasn’t so typical. Washington, who stars in one of ABC’s top-rated TV shows, now has her pick of the best roles Hollywood has to offer. But she explained to graduates that things weren’t always like that. While at GWU, Washington once earned a role as the lead frog in “Croak: The Last Frog.” Despite her reticence, the role was an offer she couldn’t refuse. “Now I have to be honest with you, it was not my lifetime dream role to play a frog,” Washington said to the commencement crowd. But because she had to audition for every role in her acting program in order to keep her scholarship, she didn’t have the luxury of choosing which characters to play. After coming to terms with the part, the student took the role in stride; she visited the National Zoo, studied its frogs, watched frog documentaries and learned how to use her body in new, frog-like ways. “To this day, it is my father’s most favorite thing that I’ve ever done,” said Washington of her big frog role. The graduating class also learned a few tidbits about Washington’s personal life. The actress explained she was wearing the honorary robes of her mother, Valerie Washington, a retired professor and educational consultant. Washington also revealed that she’s a cousin of fellow GWUalumni, Colin Powell. It’s been a busy month for the GWU graduate. She stunned us at the 2013 Met Gala, her first major fashion magazine over story goes on newsstands Tuesday, May 21, she’s currently co-staring in the film peeples and her hit ABC television show “Scandal” ended its second season by setting the record for most watched telecast ever.